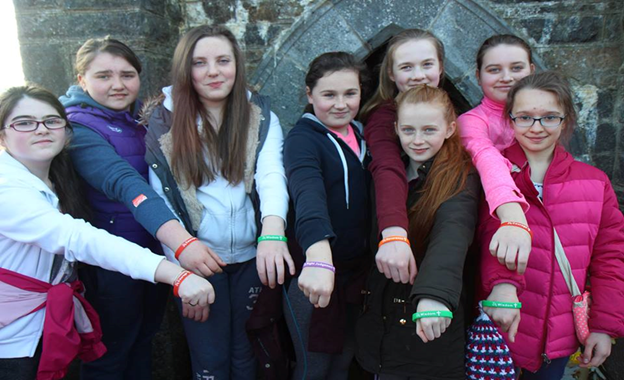 Our National Initiative continues to train many young people in our Peer 4 Peer Healthy Lifestyle programme. In 2012 thw programme was happening within 8 diocese with hundred of young adults being trained with new leadership skills. Here is a sample of the programme in County Limerick. In 2011/2012 Elizabeth Cullinane & Mary Danaher from the Abbeyfeale & District Initiative, trained and up-skilled 26 students in order to deliver a peer programme covering Communication Skills, Cyber safety, Bullying & Peer Dynamics, Substances legal & illegal, Attitudes & Self-esteem, Natural Highs, Decision Making, Friendships & Relationships. This was then delivered to a number of Primary Schools for example; Co Limerick = Abbeyfeale (x5 local schools: Dromtrasna, Knocknasna, Meenkilly, Scoil Mháthair Dé and St. Marys Boys), Athea and Templeglantine. Transition year students were matched depending on the numbers and the area they lived in thus building a rapport for future students to know a face on starting (mentoring/buddy system). It is hoped Mountcollins & Tournafulla will get involved next year. All 26 transition year students that took part in the training received Certificates in recognition of all their hard work which will stand to them when applying for college or work in the future.